Black Knight Chronicles Omnibus - Featuring all 3 books of the Black Knight series featuring vampire private detectives Jimmy Black and Greg Knightwood. Death's Rival - The fifth installment of the "USA Today"-bestselling fantasy series featuring Jane Yellowrock, a shape-shifting skinwalker in New Orleans. Grave Memory - Solving murders by raising the dead, grave witch Alex Craft is hired to investigate a suicide in Nekros City and discovers a new kind of magic that can overcome the human will to survive. Louisiana native, Faith Hunter, likes horses, dogs, fishing, crabbing, whitewater rafting, and RVing. Fascinated by history and ancient writings, she can trace her roots to William the Conqueror’s invasion of England in 1066, to Sehoy III, an American Indian princess, and to the gens de couleur libre, the New Orleans free men of color, before the Civil War. As a girl, she read five books a week, wishing she, “could write that great stuff.” Teachers in high school convinced her she could, and she’s been writing ever since, with a desire to see ultimate good fight and defeat ultimate evil, and humans as part of the battle. Her books to date are BLOODRING (2006) SERAPHS (May 2007) and HOST (Nov 2007). Faith shares her life with her Renaissance Man and their dogs. 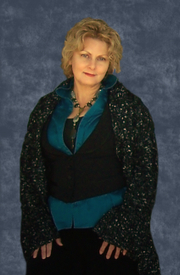 Faith Hunter is currently considered a "single author." If one or more works are by a distinct, homonymous authors, go ahead and split the author. Faith Hunter is composed of 4 names. You can examine and separate out names.